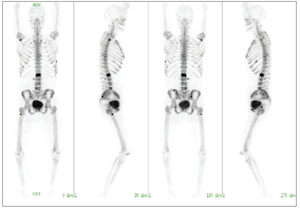 PET/CT bone imaging using Sodium Fluoride may be a good alternative to traditional bone scans. Patients with solid tumor cancers such as breast, lung and prostate often experience metastasis to the bones. When compared with other types of imaging for bone scans, the sodium fluoride PET bone scan is able to more accurately detect the spread of cancer to the bones. The image above is a Sodium Fluoride PET scan. It's easy to see the bright spots on the bones which are the bone metastases. 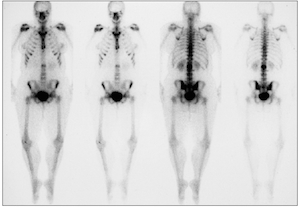 The image below is a traditional bone scan which does not show the bone metastases as easily. Illinois Cancer Specialists offers sodium fluoride PET bone scans for patients who may experience bone metastasis.